Grizzly, strictly speaking, is only a common name for the brown bears that historically existed in North America from the Great Plains and everywhere else, with the exception of the Pacific Coast of Alaska, where the bears are called brown bears. Genetic studies confirm, however, that it is the same species. Habitat loss and conflicts with humans have dramatically reduced the grizzly range, but the numbers are slowly recovering, and grizzly hunts in the Lower 48 are widely discussed. Until they become a reality, though, the only two areas in North America where you can legally go grizzly hunting are Alaska and Yukon. The grizzly hunts take place in limited and difficult to access areas of Alaska and Canada. No wonder they command premium prices. A grizzly hunt with a reputable and well-equipped outfitter will start at about $12,000 and run all the way to $20,000. Combine a grizzly hunt with a caribou or mountain sheep hunt for better overall value. Since the dawn of times, bears and humans were two similar, intelligent and omnivorous species that competed for the same environment and food sources. No wonder the idea of bear hunting still makes people very emotional, on both sides of the hunting debate. Let’s have a look at some of the arguments for and against grizzly hunting in the Lower 48. There are two main seasons for bear hunting: in spring, after the bruins leave their dens, and in the fall, before the denning time. The former runs in March to May, the latter - August to October. Both seasons are similar, in that bears feed actively, in order to accumulate enough fat for the denning, or to compensate for calorie loss during winter sleep, and concentrate around preferred food sources. In addition, less dense vegetation makes it easier to locate a bear and estimate its size. People invented many ways of bear hunting: over bait, with dogs, on dens, etc. But in the USA and Canada the most common way of grizzly hunting is spot and stalk. This may be more complicated than a typical brown bear hunts, because grizzlies are seldom found on salmon rivers. 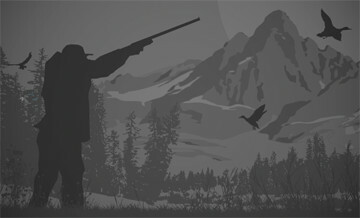 Grizzly hunting is dangerous game hunting, so be sure you’re packing an adequate rifle and load combination, and listen to your guide well. Grizzly bear, whatever the genetics says, is noticeably different from the rest of the brown bear populations in both looks (characteristic “grizzled” hair) and behavior. All brown bears combine predation and foraging for plant food in their diet, but grizzlies are less vegetarian and more carnivorous than the average bear. This influences their attitude: grizzlies are some of the most aggressive bears in the world - no wonder early American explorers christened them Ursus horribilis - and grizzly hunting is probably the only true dangerous game hunting available in North America. Bear hunting is a highly emotional business, and It is the primal emotions that make hunters go find bears, not the prospect of a big rug or entry in the trophy book. 2019 dates Aug.19-30, Aug.30-Sept.10, Each hunt is scheduled for 1 or 2 hunters/guide. Generally 2 or 3 of us are in attendance for each booking of 2 or more hunters. Daily Rate for hunters is $1000 and most hunts are 12 days Daily rate for guests is $600 Our caribou herd is estimated to be over 200,000 animals - groups of 100s or 1,000s are sometimes seen. Wolf populations are at an all time high. Wolverine seen occasionally. First Wolf is for free, starting from the second the trophy fee is applied. We have a license & tag vendorship for your convenience, in case you wish to pursue an extra animal. Unless you specify otherwise, we will have all your licenses, tags & permits ready before you arrive. We have a nice variety of color phases in Grizzlies from blond highlights with dark legs to chocolate browns to silver tips. The Arctic Grizzly is also considered to be a Barren Ground Grizzly. Our Grizzly bear hunts are perfect to combine with a moose hunt. We have harvest some great trophy moose in the same areas as the grizzly with the racks between 55 and 70 inches. The moose hunts are normally done by jet or drift boat and calling the moose in for close shots. Ask us about a combo moose grizzly hunt, it is a great way to make the most of a Alaska hunting trip. We use the most up to date and proven equipment, gear, and supplies and provide our hunters with detailed information and gear list in the months prior to their hunt. Every detail matters to us and we take extra care to provide an incredible and memorable hunt. Obtaining Tags and License please visit the State of Alaska Website (http://www.adfg.alaska.gov/index.cfm?adfg=hunting.main) for the needed tags and license(s). Trophy fees are to be paid one month prior to trip to the US office or Outfitter where they will be held until completion of the hunt and either kept by Outfitter for successful harvest of animals or returned to client within 10 days for any non-harvest of an animal. All species hunted or potentially hunted should be confirmed and paid for prior to arrival at camp to our US office.